The techniques and knowledge to create interesting, effective animations can be used in a very wide variety of workplace settings. You could make attention-grabbing advertisements, interactive games, or impressive flash websites. We will be learning basic 2-D animation techniques, leading up to the possibility of exploring 3-D animation in the more advanced levels of Digital Media. Making objects and text move in order to catch the eye is a skill that not everyone has, so it can be highly marketable and profitable when properly applied in the real-world. The software we will be using in Digital Media to create animations is Adobe Flash. It is an industry-standard program that is highly capable and versatile. Flash uses a timeline-based interface that can incorporate both frame-based and vector animation techniques. It can also utilize ActionScript coding to create interactive features like buttons and controls. It is rather expensive, especially for the amateur animator, but it is considered the best in the industry. At the beginning of this unit, we will be learning basic animation techniques through a few very quick and easy projects. After you have learned the fundamentals of Adobe Flash, you will apply your skills to create descriptive animations that accurately portray a complicated process to your audience. Finally, we will finish by learning frame-based techniques to produce a project that resembles an animated game. Inside the SKILLS page, you will find project descriptions and constraints, the files necessary to complete each project, and how you will be submitting your finished works of art. Animations can take many different forms. During this unit, we will learn the characteristics of several types of animations, and what each is commonly used for. We will also learn the correct process for producing professional animations and information about file types. All of this information will help you create industry-standard animations. Inside the KNOWLEDGE page, you can find and download the PowerPoints I use during class lectures and discussions, links to take your assessments on BlackBoard, and other learning resources. 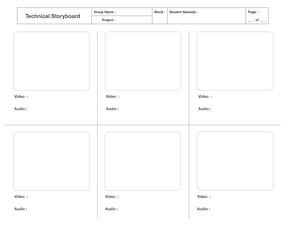 The utilization of a storyboard for planning purposes is absolutely necessary if you intend to create effective, interest-grabbing animations. Use the template on the right to plan out movement of objects, background noises and/or sound effects, and how the overall progression of your animation will take place from start to finish. Sketch out the visuals and describe the technical details in written form. If this planning stage is used appropriately, it will help eliminate inadvertent mistakes that can result in an ineffective animation. Adobe Flash is a very high-powered software that can be used to create a wide variety of animations for any type of client. Throughout the semester, we will be only learning a small portion of what this program is able to do. If you would like to explore its capabilities more in-depth, use the resource websites on the left to discover many more useful tools and features of Flash. Adobe Flash is an awesome program that is capable of creating many different types of animations. However, it is rather expensive. Use the links below to find a few animation softwares that are free to download and use. They are not quite as powerful as Flash, but they will get the job done in most cases. I have not used any of these softwares extensively, so use the resources on each individual website to figure out its tools and features. Animations can be taken to the next level by incorporating simple sound effects. Adobe Flash has a great library of sound effects included into the software, but sometimes it's hard to find the perfect sound for the action that is being animated. When developing advertisements and promotional animations for television shows or movies, incorporating the original theme song helps your audience immediately recognize what the purpose of your project is and who it was made for. 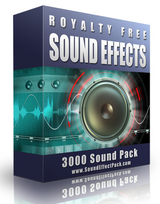 If you click on the image above, you will find a gigantic library of royalty-free sound effects that are free to download and use. Either find the perfect one you like and get it individually, or download the entire sound pack for the extensive library of free-to-use sounds. Keep in mind that using these songs outside of a classroom setting violates copyright and trademark policy. Click the image above to find a HUGE library of theme songs. Frame-based animation is a technique that places individual images in a progression that tricks the human eye into seeing continuous motion. 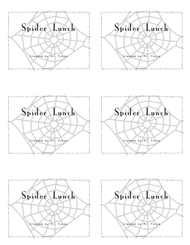 This type of animation is clearly illustrated in a flip book format. On the left is a printable file that can be assembled into a flip-book. Cut out each image and staple them in order, then flip each page quickly to see the continuous motion. On the right is the .FLA file of the resulting animation. Check out these cool animated videos that demonstrate the capabilities of Adobe Flash. They are exciting and fun to watch, and were made completely using Flash. See if you can identify the software interface that appears throughout each video.